Aleksandr Askoldov’s The Commissar (“Комиссар”) was part of the ‘new wave’ cinema that emerged from Kruschev’s Thaw. 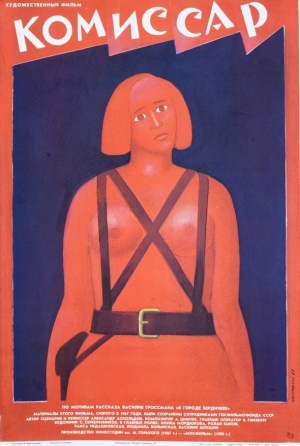 Based on Vasily Grossman’s ‘In the town of Berdichev’, it questions Bolshevik totems and introduces themes of Jewish and feminine identity in a way that would have been unthinkable previously; naturally it was banned as soon as it was completed in 1967. The Jewish ethnicity of the central family, the Magazaniks (Rolan Bykov, Raisa Nedashkovskaya), was the principle reason for the film’s prohibition. Against the background of the Six Day War, the USSR censured Israel and the rise in Jewish nationalism at home. Anti-Semitism in the USSR was an issue manipulated by Soviet leaders for various means. Although there were prominent Jewish actors, film-makers and the like, Soviet films often did not depict Jews. Soviet films even went so far as to remove Jews from portrayals of the Holocaust (Destiny of a Man, Remember Your Name). Askoldov’s politically neutral depiction is remarkable in itself and even more so given the other themes it touches upon. The Commissar questions the core values of Bolshevism; a de-feminised Commissar (Nonna Mordyukova) becomes torn between her duty to the Revolutionary cause and her newborn child. Her dilemma arises through residing with the altruistic Magazaniks, a result of her unplanned pregnancy. As a devoted Bolshevik she abandons her child to rejoin the war – a decision Askoldov’s film perceives as unnatural rather than admirable. Like many Soviet films The Commissar is engaging; both chilling and tender with superb performances. It can be rented for free on LOVEFiLM or watched in the original Russian on YouTube. My post on Kinobuff about ‘The Commissar’ (1967).